The 2018 World Cup is nearly over but the fight to end domestic violence is not. Did you know that for several years, British organisations have recorded a rise in reports of domestic violence after England’s World Cup matches? Reports like this highlight the ugly side of the beautiful game. To raise awareness of the link between The World Cup and Domestic Violence PAC & PDVI have launched ‘The ugly side to the beautiful game’ campaign. With England getting so far in the tournament, we thought this was the perfect time to bring awareness to this subject and to break the stigma of domestic violence. 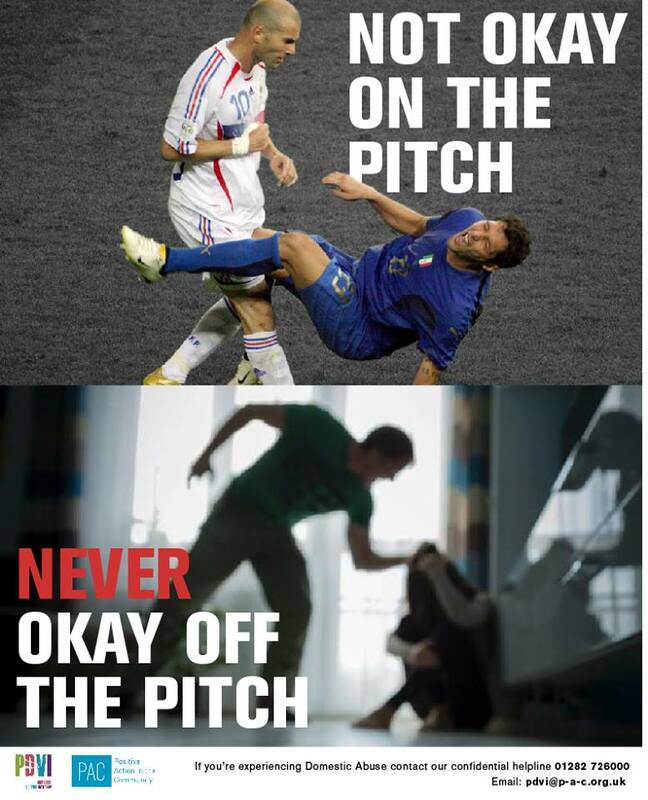 In 2014 UK Police say there was a significant rise in domestic abuse reports from the last world cup. The research found that incidents of domestic abuse rose by 38% when the England team lost and increased by 26% when England won or drew compared with days when there was no England match. 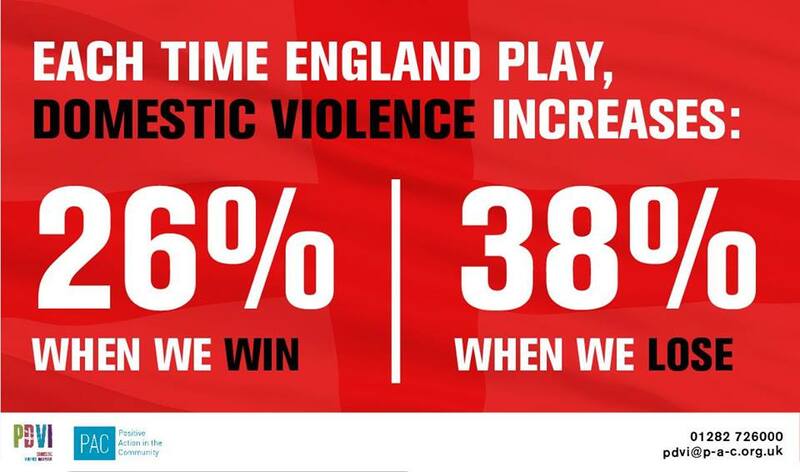 Incidents of domestic abuse were also 11% higher the day after an England match. Police, politicians and domestic violence organisations around the UK are banding together in full force to combat the worrying trend. We believe victims are more likely to come forward for support and help if we push awareness like our current social media campaign. PDVI have a confidential helpline available to offer support to both men and women. The term ‘domestic violence’ is often associated to just women. However, in recent years there has been a rise in men reporting domestic abuse. We believe society needs to be made aware that this type of violence does affect both genders and has the same devastating effects on the victims. Breaking down the stigma is imperative to help men that are affected. From 2012-2016 there has been an increase in males reporting domestic violence, by 22%, and we believe this could be the tip of the iceberg. With organisations like us trying to beak down the negative connotations that come with males experiencing domestic violence, men have begun to come forward and seek help. Unfortunately, we know there will be many more men suffering in silence. Our aim is to spread awareness about football and domestic violence. Especially around big tournaments. Not only do we want to spread awareness we want to empower others with information and signs of people suffering in silence. Do you know the horrifying fact that domestic violence kills two women every week in England and Wales? It needs to end now. There are different kinds of abuse, but it’s always about having power and control over you. If you answer yes to any of the following questions, you might be in an abusive relationship. If you are experiencing Domestic Abuse, including physical abuse, sexual abuse, emotional abuse, controlling behaviour, threats, harassment or are subject to forced marriage and honour based violence from a partner, ex-partner or family member, we can help. Our office hours are Monday to Friday 9:00pm – 4:30pm, out of hours you can contact the national domestic abuse helpline on 0800 2000 247. If it’s an emergency, or if you or someone else is in immediate danger please call 999. If you are concerned about someone you know, you can refer them to us by calling us on 01282 726000 or by email topdvi@p-a-c.org.uk.